A few scenes from the Artists of Rappahannock Fall Art Tour video. 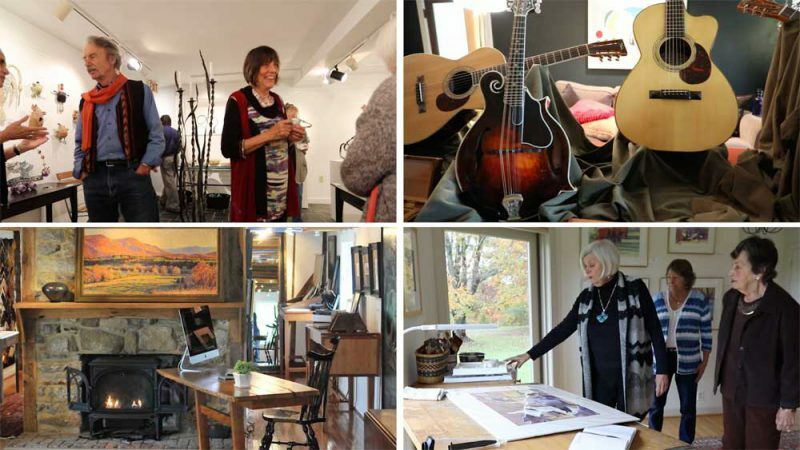 Thanks to an intensely collaborative effort, and the work of not just the artists of Rappahannock County but also some of its fabulous musicians — and the folks at the Rappahannock Association for Arts and Community, who hired Luke and me last fall to create a short video on RAAC’s popular annual studio and gallery tour — the video premiered (as a pre-feature short) last weekend at a RAAC Film Talk-Back event at the Little Washington Theatre, and is now up on the Synergist Media YouTube channel. It features music by Rappahannock’s own Gold Top County Ramblers, narration by RAAC’s Barbara Black and a script by Chester Gap writer (and RAAC board member) Pete Pazmino. I’m told the audience at the theatre applauded the short video both nights. You can watch it here. Applause isn’t necessary, but feel free to leave a comment. I think it turned out all right. 1 Comment on Time for the Fall Art Tour (Video)! lovely film capture of scenes, people, and art, almost as good as the real life experience!